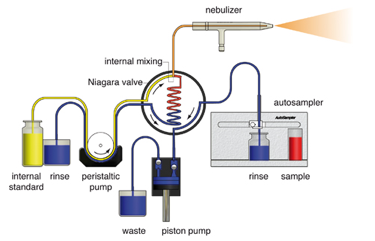 The Niagara Plus system uses Flow Injection technology to reduce analysis time and cost. The Niagara Plus utilizes a positive displacement pump to rapidly fill a sample loop and a proprietary valve with extra low sweep volume to provide the ultimate in ICP productivity. 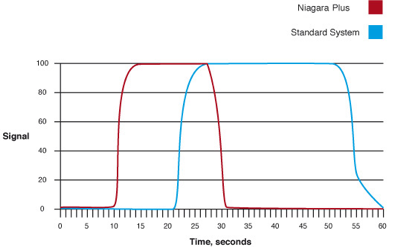 Typical cycle time for Niagara Plus compared with standard ICP system. 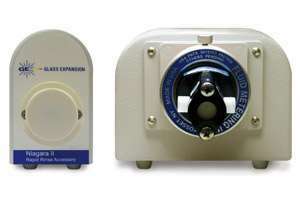 The positive displacement piston pump rapidly fills the sample loop. At the same time, rinse and internal standard solutions are delivered to the nebulizer, washing out the nebulizer and spray chamber, and ensuring that plasma stability is maintained. 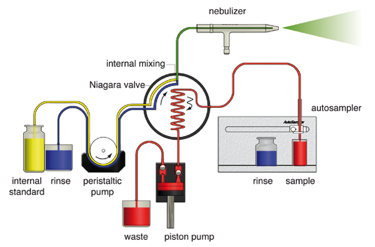 The Niagara valve switches position so that the rinse solution pushes the sample into the nebulizer. The internal standard is mixed with the sample within the valve. At the same time, the autosampler probe and sample uptake tubing are rinsed by the piston pump. Note that the sample does not contact the peristaltic pump tubing at any time.